A new Tinder-like app lets you filter out the dogs -- not that you'd want to. The free pet adoption iPhone app has been released by AllPaws, a website designed to make pet adoption more like online dating. The AllPaws app features more than 200,000 listings of adoptable animals -- dogs, cats, horses, sheep, birds, pigs and reptiles, among them -- which you can sort in various ways including by breed, energy level, size, coat length and special needs. This handsome guy is Zo. 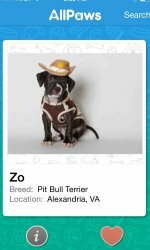 He's available for adoption through the Animal Welfare League of Alexandria, Virginia, and is one of more than 120,000 dogs on AllPaws. AllPaws founder Darrell Lerner, who created online dating sites and apps for humans before he began working in the animal rescue world -- "Tinder before Tinder," is how he put it -- says his entire goal is to help pets get adopted using this ultra-addictive, photo-heavy platform. "It's really simple. It's very easy to find a pet," he says. Find a listing you like? The app has a messaging feature -- no, not to email the animal itself, that would be pointless! -- through which you can communicate directly with shelters and rescue groups throughout the U.S. and Canada about the pet of your dreams. There's also the added bonus that very unlike online dating, AllPaws comes with a low risk of rejection. Download the AllPaws app in the iTunes store. And get in touch at arin.greenwood@huffingtonpost.com if you have an animal story to share!